During our Rome to Florence transfer, we’ll maximise our time with two great stops in Siena and San Gimignano, the “other” jewel towns of Tuscany. 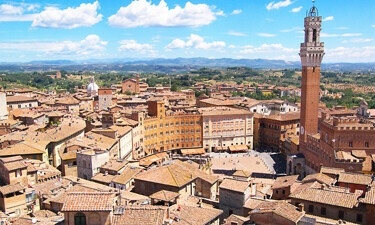 Siena is considered Tuscany’s second most beautiful town, with its red brick buildings, stupendous cathedral and of course, the world famous Piazza del Campo square. San Gimignano, is a medieval town in a truly wonderful state of preservation and perhaps the most charming and picturesque of all Tuscany hill towns. It’s noted mainly for the 13th century towers that still dominate the skyline. 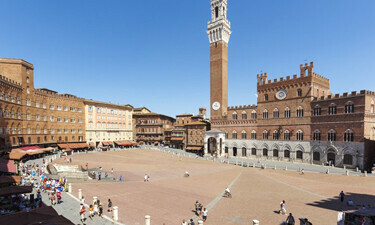 8.30 am – Departure from your hotel for a 75 minute drive to Siena. An exceptional town not only for its enchanting Gothic atmosphere, but also because it’s a living city, were the people of today go about their daily activities. This gives the visitor an insight into a contemporary Italian town. There’s much to see in Siena but I suggest you don’t miss a leisurely walk in the main street and a stop in the Piazza del Campo square to take in the atmosphere. 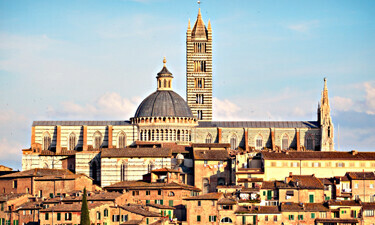 The cathedral which dominates the skyline is one of the most beautiful in Italy, and again well worth visiting. Then browse around at your leisure, every turn you take will lead you to something of interest. Lunch is at your leisure and you may choose if you wish to eat in Siena or later in San Gimignano. 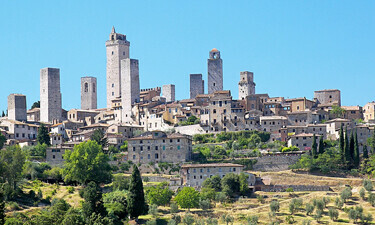 We then continue or private transfer in Tuscany and leave for San Gimignano where we arrive in less than an hour. San Gimignano was the Manhattan of the 13th century boasting seventy two towers; today fourteen are left. They were built as symbols of wealth and as a security measure by the town’s prosperous merchants of the time. We start our day with a walk up the main street which leads to the town piazza, with its wonderfully preserved medieval stone buildings. The town has an atmosphere all of its own which you are sure to enjoy. You may like to visit the museum which takes you up the highest tower which has been restored to its original state. From here you’ll have great view over the rooftops. The gelato in the piazza is worth tasting too! If you enjoy walking, you may like to hike around the perimeter of the old town walls. We conclude our stay and depart for Rome/Florence. The Rome Florence transfer via Siena San Gimignano has a duration of approx seven & half hours hours. Please note: by Italian law, driver guides are not allowed to do historical guiding of museums, monuments and city sights. 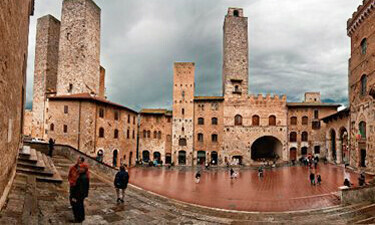 Therefore your visits to Siena and San Gimignano are in free time.